I ran this event in 2013 as my 2nd ever Ultramarathon, it was so well organised and good value that I planned to return in 2014. 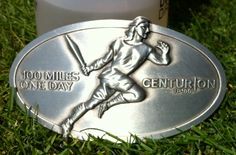 It was scheduled for 2 weeks before my first 100 miler, so I wasn’t sure if this was a good or bad thing. I needed to strike a balance, I didn’t want to push too hard and affect the all-important Thames Path 100, but I still wanted to beat my previous years time. I “camped” the night before at the Compton cricket pavilion / social club. There was only a few people staying over, and I got a pretty good nights sleep. Up early and a breakfast of weetabix. Cereals, tea and coffee were provided to anyone staying over. The Race HQ is at the school and after checking in and helping myself to more free coffee I chatted to a couple of other runners, one of whom had driven from Cornwall that morning! We assembled outside on the school field, some people were here to run 20 miles, some of them were running around as a “warm up”. A quick briefing and we were off. After one lap round the outside of the school field, to disburse the runners, we left the school. The pathway initially is quite narrow so we were all slowed to a walking pace for some of this. They’d be plenty of time for running later. The first lap did fell a bit congested and I looked forward to the 2nd lap when the ultra runners would be spread out along the course. The route is so well marked, with a combination of signs, tape tied to branches, and flour marks on the ground that there’s very little chance of getting lost. It seemed every time you think you might have missed a turn there’s a marking to reassure you. Very well done! I made a concious effort to eat at the early checkpoints as I know from past experience I don’t feel like eating but I start to suffer if I don’t. The weather was almost ideal, clear skies and no wind. Perhaps a little too warm at times for me. Some lovely countryside to run in, with lovely views. Not too hilly. 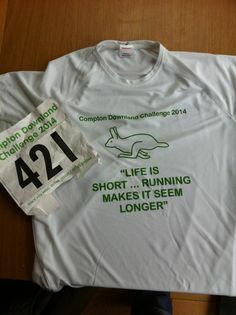 Except for the “Compton Mountain” 🙂 A monster of a hill mid-way through the lap that just goes on and on. I finished in a time of 6:59:35, 23 minutes faster than the year before. 36th out of 119 finishers. 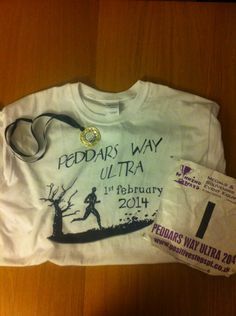 Having done a few events now I’ve got to say this is one of the best – very well run, friendly, great route marking, great offroad route, scenery, good mix of terrain, not too hilly, nice checkpoints, hot meal at the end, t-shirt, the list goes on – and all for £18!